After successfully returning home from the International Space Station, the Expedition 23 crew of Soichi Noguchi of Japan (left), Oleg Kotov of Russia (center) and Timothy "T.J." Creamer of NASA celebrate with recovery teams at their landing site in Kazakhstan on June 1, 2010 EDT. Full Story. Thisstory was updated at 11:39 p.m. ET. ARussian Soyuz spacecraft landed safely in Kazakhstan late Tuesday to return acosmonaut and two astronauts back home from the International Space Stationafter nearly six months in space. TheSoyuz TMA-17 spacecraft touched down at about 11:25 a.m. EDT (0325 WednesdayGMT) on the steppes of Kazakhstan in Central Asia with Russiancosmonaut Oleg Kotov and two crewmates ? one each from the United States andJapan ? onboard. Recoverycrews reported that the Soyuz capsule had tilted on its side after landing,which has happened before, but overall it was a smooth landing, NASA officialssaid. It was 9:25 a.m. Wednesday local time at the landing site. "Bye-byestation!" Kotov said as the Soyuz carrying him and two crewmates departedthe orbiting lab, revealing the huge space station ahead. "Beautifulview." Heis returning to Earth with American astronaut Timothy "T.J." Creamerof NASA and Japanese astronaut Soichi Noguchi. The three men made up half ofthe space station's full six-personcrew and had lived aboard the orbiting laboratory since mid-December. 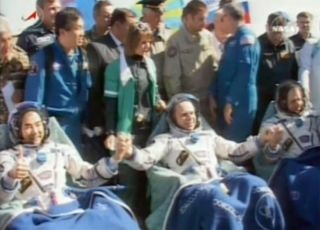 Allthree Soyuz crewmembers were in good health and spirits after landing, a NASAspokesperson said from the scene. TheSoyuz TMA-17 landed just hours after undocking from the space station at 8:04p.m. EDT (0004 Wednesday GMT) as both spacecraft flew 215 miles (346 km) aboveMongolia. Kotov said the undocking went extremely smoothly. "Strapin tight guys," said station crewmate Tracy Caldwell Dyson, an Americanastronaut representing NASA who stayed behind on the station with two othercosmonauts to start the Expedition 24 increment. There were hugs all around asthe two crews parted. Dysonwarned the three men returning to Earth not to stick their tongues out duringthe Soyuz's jarring landing. She and her remaining crewmates are in the middleof their own six-month mission. Duringtheir 163 days in space, Kotov and his crewmates hosted three visiting NASAspace shuttle missions. Those flights delivered a new NASA room, seven-windowobservation deck, and vital spare parts and supplies. Themost recent visit by NASA's shuttleAtlantis in May delivered a new $200 million Russian research module calledRassvet (which means "Dawn" in Russian). Noguchiand Creamer also took advantage of a new space station amenity during theflight ? the ability to use Twitter from space. Noguchi regularly postedstunning photos and messages to the 252,236 followers of his Twitter account,where he wrote as Astro_Soichi. Beforeleaving the station Tuesday, he posted one last photo of himself in a re-entryspacesuit while waving. His final message from space: "Bye!" ? OnMonday, Kotov officially turned control of the space station over to its newExpedition 24 commander Alexander Skvortsov. "Goodluck, guys," Skvortsov told the spaceflyers as they left the station. "Have a soft landing." Lastweek, Creamer said that after more than five months on the spacestation, he was eagerly looking forward to returning to Earth and seeinghis friends and family. And while Creamer admitted that he will miss thecamaraderie of his crew and the view of Earth from space, there are somecreature comforts that cannot be recreated in weightlessness. "Specifically,I'd really like to drink something not from a straw and have food stay on theplate for a change," he said. Videofrom the landing site showed Creamer taking a hearty bite from an apple givento him just after returning to Earth. WithKotov and his crewmates back on Earth, Skvortsov and his crew will get startedthe station's Expedition 24 mission. Skvortsovarrived at the space station in early April with Caldwell Dyson and fellowRussian cosmonaut Mikhail Kornienko. The spaceflyers initially joined theExpedition 23 crew and will now remain behind to await the arrival of three newcrewmembers slated to launch from Kazakhstan's Baikonur Cosmodrome on June 15. ThatSoyuz TMA-19 spacecraft will launch with veteran Russian cosmonaut FyodorYurchikhin and American astronauts Douglas Wheelock and Shannon Walker on a newsix-month mission that will also span several station expedition crews.